Senior Jess Rheinheimer and sophomore twins Maleke and Jerome Jones lead the women’s and men’s basketball teams into the 2015-16 season with the first games of the season beginning in mid-November. Preseason polling ranked the women second and the men eighth in the Old Dominion Athletic Conference (ODAC). The men play their first conference game Nov. 29 at Randolph and the women host Lynchburg Nov. 24. A variety of season ticket packages for men’s only, women’s only or a combo of all men’s and women’s home games are offered. EMU’s home games routinely host large crowds, with an average of 393 fans for the women’s games, a statistic that leading the ODAC and puts EMU 39th in the nation among D-III teams. The men averaged 757 for their games, third in the ODAC and 28th out of 417 D-III team s in the nation. Fans will definitely want to cheer the women on at home: the Royals (88-22 over the past four years) also take a 30-game home winning streak into this season, with a 54-49 setback against Elizabethtown on Jan. 7, 2013, standing as their last loss in Yoder Arena. Despite the loss of five seniors, the ODAC’s coaches aren’t expecting much of a fall off for EMU’s women. Eastern Mennonite, riding a string of three straight NCAA Tournament appearances, received three first-place votes and totaled 106 points in the voting. Lynchburg College earned six first-place votes and 114 total points to claim the top spot. The Royals return three starters, including the ODAC Player of the Year and All-America forward Jess Rheinheimer (Manheim, Pa./Lancaster Mennonite). A 5-10 senior, Rheinheimer scored 20.0 points with 7.8 rebounds per game last year. She was named ODAC Player of the Year and was a D3hoops.com All-America Fourth Team honoree. She was recently named to the D3hoops.com Preseason All-America First Team. The women also return senior point guard Alicia Ygarza (Conestoga, Pa./Penn Manor) (2.3ppg, 4.1rpg, 2.2apg) and sophomore guard/forward Sa’Mone Moore (Covington, Va./Covington) (6.3ppg, 2.0rpg). Click here to see the entire 2015-16 EMU women’s basketball schedule. As could be expected, the ODAC coaches see that EMU’s basketball men have some rebuilding to do. A year after finishing fourth in the standings, the Runnin Royals were tabbed to finish eighth in the nation’s toughest conference. Eastern Mennonite returns just six men from last year’s roster, all sophomores. Including All-ODAC performers David Falk and Marcel Crump, the men lost six seniors from a 17-10 squad. 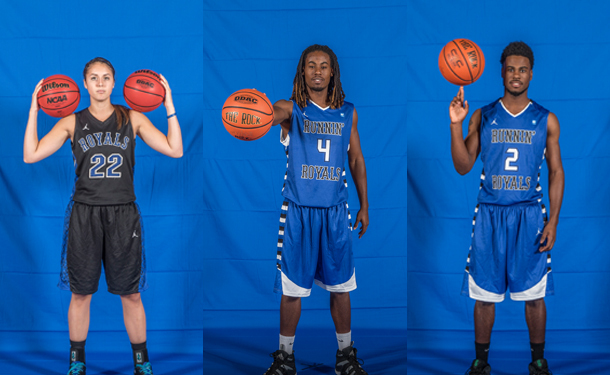 Five of them started during the postseason run into the ODAC Semifinals. Jerome Jones (Charles Town, W.V./Washington) started 14 games as a freshman in 2014-15, and was fifth on the team with a 7.6 scoring average. He shot 36.2% from three-point range and scored in double figures in ten games. His twin brother, Maleke Jones (Charles Town, W.V./Washington), expects to elevate after being the backup point guard last year. RaShawn Latimer (Warrenton, Va./Kettle Run) shot a team-best 40.0% from outside and averaged 3.8 points per game. The Runnin’ Royals open the new year Saturday, Nov. 14, hosting Virginia University of Lynchburg 30 minutes following the completion of the women’s game, or approximately 6:30 p.m. The men play just two games in Yoder Arena over the first semester. They also play at D-I James Madison University on Tuesday, Nov. 24. Click here to see the entire 2015-16 EMU men’s basketball schedule.